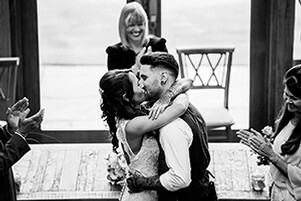 As a creative and documentary wedding photographer based in the Midlands (Hinckley, Leicestershire) I have developed my personal style of wedding photography over the 12 years I have had the privilege of it being my full time profession. Relaxed, journalistic, documentary and alternative are many words used to describe my style of work, I have always called it photography with soul. Located in Hinckley, Leicestershire and include 100 miles before we request travel, accommodation fees. I have been in the professional photography industry for over 13 years and weddings have been the primary focus for the past 5-6 years having shot over 250 weddings. Relaxed, journalistic, documentary and alternative are many words used to describe my style of work, I have always called it photography with soul. Yes certainly - we have people coming from all over the UK to see us. We prefer to meet clients personally as its how our business is focused - we like the "personal touch"